news Westpac chief information officer Dave Curran has outlined an ambitious IT platform consolidation strategy for the bank which will result in a centralised Customer Service Hub providing a comprehensive view of the bank’s customer data, as well as the continued rationalisation of the bank’s technology and infrastructure platforms. Curran is best known for his decade in senior technology roles at the Commonwealth Bank, including a period overseeing the bank’s highly successful core banking modernisation project under group CIO Michael Harte. He has held the CIO role at Westpac since July 2014. This week the executive gave one of his first major presentations outlining a high-level view of the path that Westpac’s IT operations will take over the next several years. The key concept which the executive wished to impart to his audience was the idea of a so-called Customer Service Hub. Currently, Curran told investors and other Westpac stakeholders this week (view the whole presentation online here), Westpac segregated its IT systems into various channels — namely, customer interfaces, customer data, ‘systems of record’ which stored transactions, and underlying IT infrastructure. There were several problems with this strategy, the CIO said. Firstly, Westpac still maintained distinct systems of record for its three major brands — Westpac, St George and BT. For example, the bank still maintained separate mortgage tracking platforms for the two banking brands. And secondly, the customer data the bank’s staff needed was difficult to access — as it similarly wasn’t integrated. 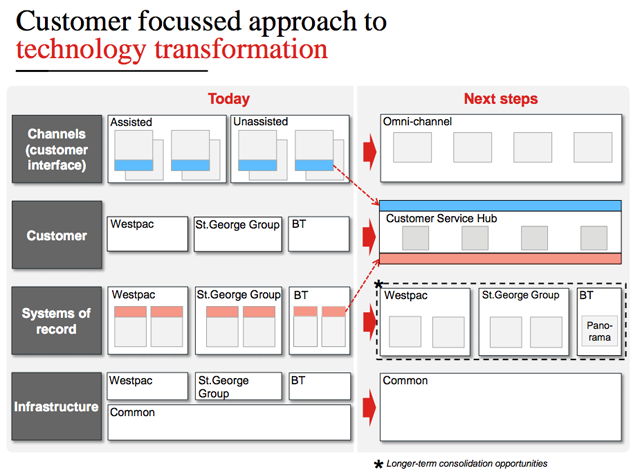 The solution for Westpac — as per the diagram below — appears to be both integrating its systems of record IT systems (so that it has a single platform across its three main brands), as well as bringing together its customer data in a single access point for staff. In Australia, other banks — notably the Commonwealth Bank and National Australia Bank — appear to be achieving the sorts of outcomes which Curran wants to achieve at Westpac by delivering huge core banking modernisation projects, implementing all-new software from the likes of SAP and Oracle to upgrade the core systems which sit at the heart of their operations. Curran said he was aware of the core banking meme in the sector. “Everyone says: Here’s Dave Curran — core banking is the simple answer,” he said. 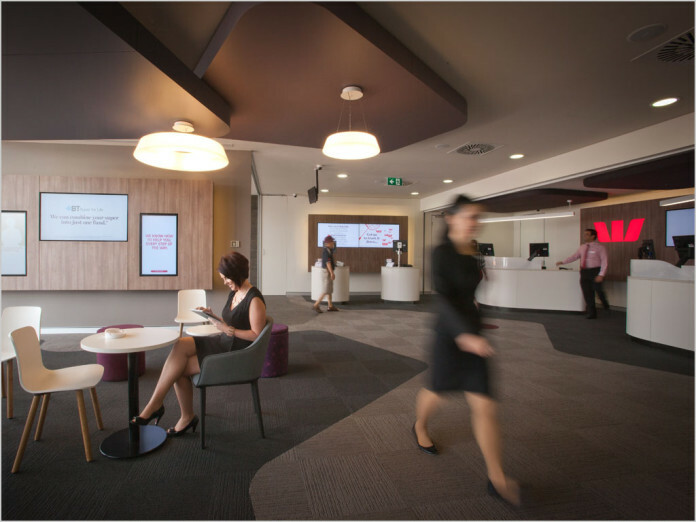 Westpac is doing some work to its core — upgrading CSC’s Hogan platform. However, the Customer Service Hub strategy was not a single, stand-alone monolithic strategy as the other banks were pursuing, Curran. Instead, Westpac was isolating its systems into a “series of components” which would let it “avoid having to do this big core banking” project. “They’ll be stand-alone projects, not dependent upon some huge program for completing them,” he said. The first platforms to be ingrated into the Customer Service hub was Westpac’s ‘home ownership product line (including mortgage systems but also other product lines) and its BT investment systems. Alongside this initiative will be the continued consolidation of Westpac’s technology platforms, and its infrastructure. Curran noted that the bank curently used three different types of IT infrastructure — public cloud computing infrastructure, its own private cloud infrastructure, and traditional legacy inflexible infrastructure used to support discrete applications. The bank was making increasing use of public cloud infrastructure, Curran said, but he noted that because Westpac is a bank (subject to strict regulatory controls), it was not able to put customer data “anywhere near a public cloud”. Consequently, it prefered to use its own private cloud infrastructure. The bank will continue to have legacy applications which would require traditional discrete infrastructure, the CIO note, but he was trying to get rid of as much of that style of infrastructure as possible. And the bank will use a ‘platform as a service’ layer on top of the three different types of infrastructure in order to abstract it. Curran noted that technological change in the area of IT infrastructure continued to be strongly felt in the bank’s operations. To give an example, the CIO noted that two months ago, a gigbyte of data storage would cost Westpac 75 cents per month. Today, because of changes it had made, that storage cost the bank 30 cents per month and next year the cost would likely to be 20 cents per gigabyte per month. In three years, at the completion of the bank’s IT infrastructure consolidation program, Curran noted the cost was likely to be below 10 cents per month, driving savings of more than $100 million in the area of storage alone. Nevertheless, the bank’s compute requirements continue to grow. Its storage requirements are doubling every 18 months and its network bandwidth requirements are doubling every 12 months. Westpac’s own internal technology cycles are also continually speeding up. For example, Curran noted that the bank had redeveloped its Internet banking site for St George three times in seven years. The bank was no longer putting in IT systems which it expected to use for thirty years, the CIO noted. Ultimately the broader technology rationalisation program will have a substantial effect upon Westpac’s technology spend, with the bank increasing its annual investment spend by about 20 percent to around $1.3 billion — with a substantial amount of that focusing on technology spend. So it looks like what we’re seeing from Westapac here is three main trends, those being: A single view of the customer, rationalisation of its technology platforms, and continued consolidation and standardisation of its underlying IT infrastructure, with continued interest in the bank’s well-established private cloud platform. I’m not 100 percent clear on everything that Curran is planning. To be honest, even for a seasoned listener of tech-oriented presentations such as myself, the CIO’s speech yesterday was heavily, heavily filled with technology jargon and high banking IT architecture concepts which I would challenge everyon to follow. However, I find it hard to fault the steps which Curran and Westpac are taking, without knowing more about the bank’s underlying systems. Of course, there is the continued question of whether Westpac is investing enough in its IT operations, or being ambitious enough about change. It is obvious that CommBank spends more on IT, and pushes harder for change, than any of its rivals in Australia. As a result, the bank has stolen a march upon banks such as Westpac in terms of keeping up with — and ultimately leveraging — the speed of change. If you examine Westpac’s IT strategy as outlined by Curran in the context of Westpac’s world, it makes complete sense. But if you compare that strategy to what CommBank has achieved over the past few years, in terms of agility, in terms of efficiency, in terms of new product development, all fuelled by harnessing technological change, you would have to conclude that even the moderate IT straregy announced by Curran this week is too slow. Of course, as one of the main architects of CommBank’s IT strategy, Curran would be painfully aware of this fact. Imo this is really sensible, I’ve just spent nearly 2 years working on NAB’s NextGen banking project. Aside from the fact that NAB are the cornerstone customer for Oracle’s Banking Platform on the ExaLogic/Data platform, it’s a gigantic project and seems to be near impossible to manage well. Imo it’s a classic case or tying to do too much and is struggling to deliver the basics after 5 years. That said, it’ll likely be worth the cost … if they stick with it.